Very well kept up leave with really nice vehicles love the infinity section better Bryan Webber is a very cool dude also. I'll highly recommend. Friendly and courteous staff, great buying experience! Looking for a new or used vehicle in Des Moines, IA? 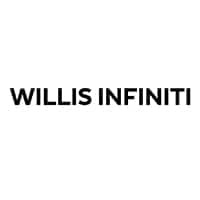 Willis INFINITI is the place to be. We proudly serve our Des Moines customers with an updated selection of new and used vehicles. Browse online and select your preferred sedan, convertible, crossover, SUV, or coupe. We believe in getting our customers the right car and the best after-sales service. We are one of the most popular dealers around. We would also like to be your preferred Ames, IA INFINITI source. Schedule an appointment with us today! Willis INFINITI is proud to be your Des Moines dealership of choice! You can find our new and used dealership on 2101 NW 100th St. It’s our goal to exceed your expectations from test drive to delivery and beyond. Please feel free to browse our extensive inventory of new and certified pre-owned cars and SUVs. In addition to our friendly and knowledgeable sales staff, we also provide financing, service, and parts. Visit us in Des Moines or contact us at 855-638-2262 to schedule a test drive.